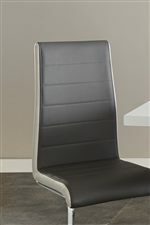 Ideal for a contemporary dining space. 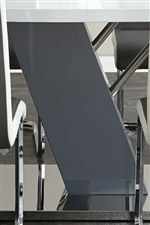 The rectangular table top and chrome base highlight the piece's modernity and are connected by a single angular pedestal. The white high sheen lacquer finish of the table top allows for easy cleaning. The Nevada White Rectangular Table with Chrome Plated Base by Steve Silver at Walker's Furniture in the Spokane, Kennewick, Tri-Cities, Wenatchee, Coeur D’Alene, Yakima, Walla Walla, Umatilla, Moses Lake area. Product availability may vary. Contact us for the most current availability on this product. NV500T Nevada Dining Table Top 1 35" 71" 2"
NV500B Dining Table Base 1 32" 11" 8"
The Nevada collection transforms the more traditional dining space into one that is more contemporary. The contrasting tones of the table and chairs add to the modernity of the collection. Family and guests can dine in comfort with the ergonomically designed chairs, which fit perfectly around the rectangular table. Whether dining or entertaining, this collection provides a modern spin on the traditional dining space. The Nevada collection is a great option if you are looking for Contemporary furniture in the Spokane, Kennewick, Tri-Cities, Wenatchee, Coeur D’Alene, Yakima, Walla Walla, Umatilla, Moses Lake area. Browse other items in the Nevada collection from Walker's Furniture in the Spokane, Kennewick, Tri-Cities, Wenatchee, Coeur D’Alene, Yakima, Walla Walla, Umatilla, Moses Lake area.